This was quietly introduced last year by our friendly neighbourhood brewery, GAB (Guiness Anchor Berhad) and I believe the brand was re-launched this year in April 2014. 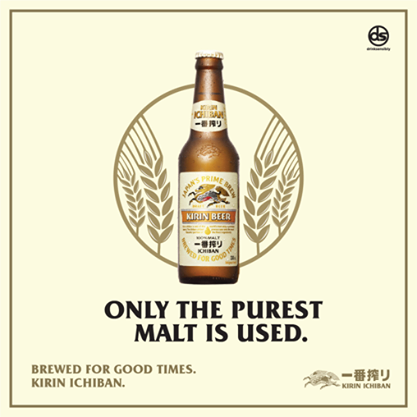 Kirin Ichiban, simply translated means Kirin No. 1. This basically means that when the beer is brewed, only the FIRST (hence, No.1!) extraction of the product is bottled - which is usually the least unadulterated. You can read about brewing beer here, should you like to geek out a little bit more. This is the first time I've had a taste of Kirin. I've had experience with Sapporo and Asahi before (which I both enjoy) but Kirin, while less crisp & refreshing (than the Asahi, for the sake of comparing) is smooth, satisfying, full-bodied and less dry. This beer is love at first taste. If you've never really had a fondness for lager (specifically this in the style of American Pale Ale Lager) before, you might change your mind with this. The biggest drawback for me (be forewarned) is the price of this bottle at the outlet. The pub I visited charged me a really painful RM20++ per 330ml bottle. I'm pretty sure you're able to get at your local hypermarket for much less. Glenfiddich and I, we go way back. It wasn't until I had a taste of that liquid heaven in my mouth. OH MY GOD! I never knew liquor could taste so good. It would change my mind towards whisky forever. It was so smooth, so sweet. So mind boggling. I mean, how could something as strong as 40% ABV taste so good? You see, Glenfiddich 12 was in the rage at some point back then. It was practically the single malt that started it all (in Malaysia, at least). Glenfiddich 12 gave me a one way roller coaster ticket into this whole new fantastical world of whisky. So I packed my bags, hopped on, and never turned back. Fast forward to now - when I received an invite to attend a Deconstruction Tasting Event of the Glenfiddich 15 years old - how could I say no? Glenfiddich was my first love I never got over. I've tried so many others but I would never forget my first love...... Then suddenly, after not being in touch for too long, this first love decides to call me up one day out of the blue, asking me for a meet up. Needless to say, I jumped at the opportunity faster than you could blink. Oh boy. It was a treat.